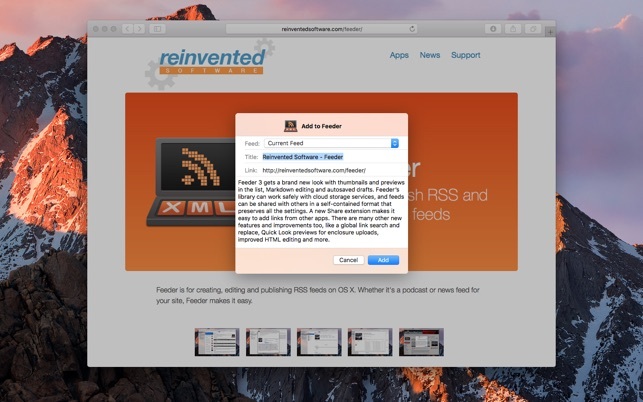 Create, edit and publish RSS feeds and iTunes Podcasts with Feeder. 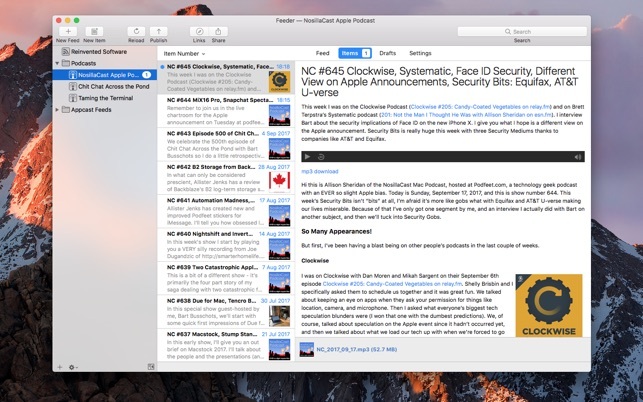 Whether it's a podcast or news feed for your site, Feeder makes it easy. Create a new feed using a templates, download feeds from the web site or import existing files. Editing content is as straightforward as writing email, so you will know instinctively what to do. Feeder has everything you need to create and publish podcasts, with full support for the iTunes Podcasting, iTunes U extensions and Flattr micropayments. Drag and drop media files to add enclosures; Feeder can automatically tag and add artwork all popular podcast file types. 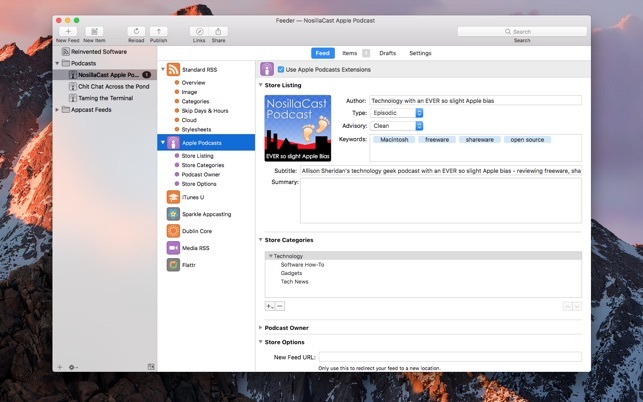 Check how your podcast will look in the iTunes Store with Feeder's iTunes Preview. Feeder can publish your feed and any media files using FTP, SFTP, Amazon S3 and WebDAV with a single click. Feeds can be scheduled for publication. Feeder can post to a blog, and announce new content on Twitter automatically. - Refreshed Design with thumbnails and previews in the list. - Share extension and bookmarklets for adding links from other apps. - Swipe to delete items on El Capitan. - Improved Social Sharing, including images for Twitter. - Share libraries with cloud services such as iCloud Drive, Dropbox, Google Drive and more. - Markdown editing, converted to HTML in the feed. - Autosaved drafts for edited items with windows restored on relaunch. - Self-contained feeds with the content and settings for sharing with others. - Search and replace all links in a feed. - Many other new features and improvements. - Fixed an issue uploading to Amazon S3 when file names contain the + character. - Fixed an issue where changing the background color of HTML and Markdown editors would have no effect. It took me a few minutes to get my Podcast info into the right form (get that picture size perfect!) But, once the basics were set, everything works easily every time. Love it! So easy to update and keep current! Feeder 3 works really well for me, and once you’ve configured the RSS URL, etc., it’s a breeze to post new items. Had a minor issue lately where the app said it was damaged. A delete and reinstall fixed and all my settings remained in place. Overall this app is solid.